HRNS is part of TEAM UP – an innovative approach to reach better results for more people. Together with the German Federal Ministry for Economic Cooperation and Development (BMZ), and the two German foundations Deutsche Stiftung Weltbevölkerung and Siemens Stiftung we are collectively aiming at improving the prospects of youth in rural areas of East Africa. TEAM UP starts as a pilot in Uganda, where half of the population is below the age of 15 and 80% of the unemployed are youth. It integrates economic, social, sanitary, pedagogical and infrastructural components to address the complex challenges and needs of over 50.000 rural youths aged 15 to 30 years (and their families) in five sub-counties of Mityana district. In Mityana, around 80% of the population is engaged in agriculture. Production rates are very low, and people struggle to make a decent living of it. The role of HRNS in this collaboration is to support youth in improving their economic situation by turning farming into a profitable business. For this, HRNS Uganda is providing agricultural, financial and entrepreneurial skills. The focus is on coffee farming as a long-term investment and seasonal crops for quick returns. Furthermore, we are supporting youth to get improved access to markets, resources, such as land, as well as financial services. Since many young people are not able to meet the requirements of official financial institutions, Village Savings and Loan Associations (VSLA) will be established to provide access to credits within the municipalities. 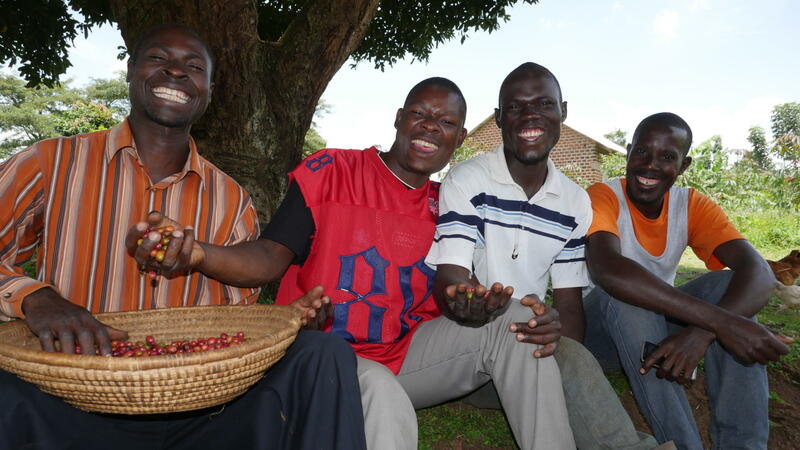 HRNS will use its network of Producer Organizations, Depot Committees and the Uganda Coffee Farmers Alliance to represent the interests of youth as part of a national community of coffee growers. In TEAM UP´s partnership approach, Siemens Stiftung is bringing in its expertise in Water, Sanitation and Hygiene (WASH) and Deutsche Stiftung Weltbevölkerung in the area of Sexual and Reproductive Health and Rights (SRHR) services as well as advocacy.